Another fine Norman Saunders cover (is there any other kind?) 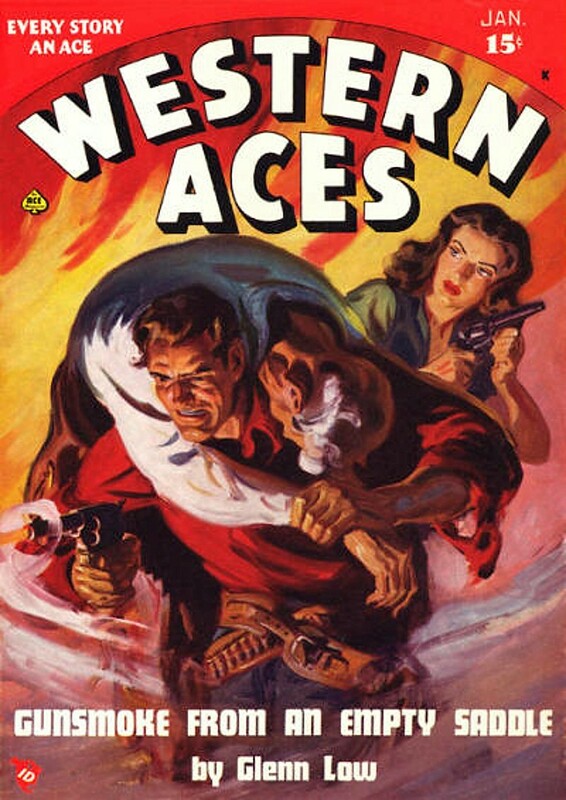 on this issue of WESTERN ACES, and a pretty solid line-up of authors inside, as well. There are the usual two stories by J. Edward Leithead, one under his name and one as by Wilson L. Covert, plus stories by two more of my favorites, Walker A. Tompkins and Gunnison Steele, real name Bennie Gardner. The cover-featured story is by Glenn Low, who published quite a few stories in the Western pulps during the Forties, then went on to write soft-core novels for Beacon Books and Novel Books, the only one of which I've read, THE BARN, was pretty good.